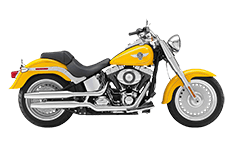 The Harley Davidson Softail Fatboy has a long-standing tradition of being an industry leader. We're proud to offer this collection of Viking Bags luggage compartments, giving riders affordable options for storing their personal items when needed. We understand that not everyone thinks the same and wants the same accessories for their bikes, therefore we've given you quite the selection of saddlebags right here in our online catalog. Simply click into each of the saddlebag pages to learn more, or give us a call and tell us what you need.